An operator of the poison oracle (benge), a boy identified as wiri dawiri Tupoi i.e. 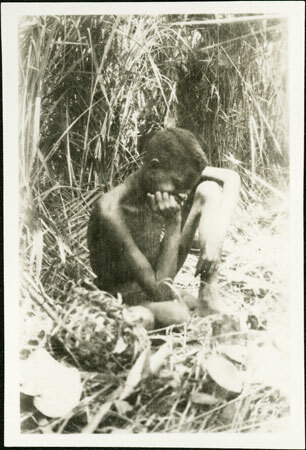 Tupoi's sister's son, sitting on the ground with his head resting on his hand. He looks down towards a fowl that has been given benge poison. Beside him is an open weave basket containing other fowls to be used with the oracle. Morton, Chris. "Consulting the Zande benge oracle" Southern Sudan Project (in development). 03 Jan. 2006. Pitt Rivers Museum. <http://southernsudan.prm.ox.ac.uk/details/1998.341.246.2/>.